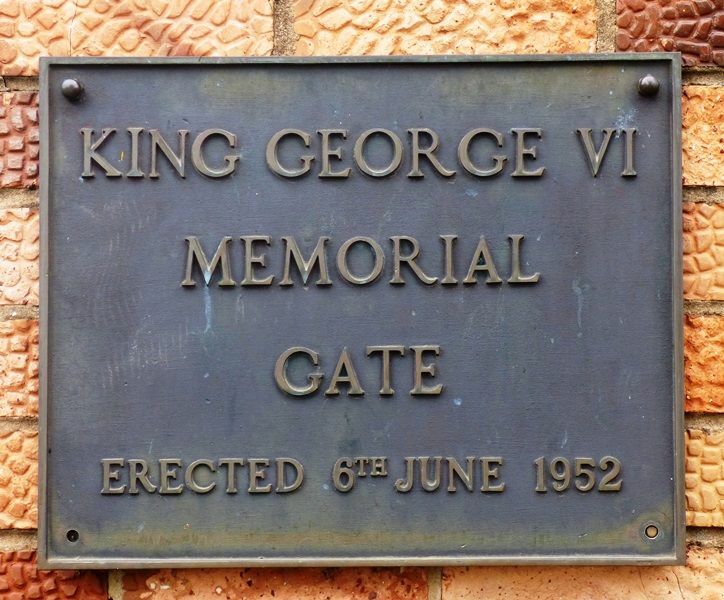 The gates at the entrance to Deakin Reserve commemorate King George VI. King George VI (14 December 1895 – 6 February 1952) was King of the United Kingdom and the Dominions of the British Commonwealth from 11 December 1936 until his death. He was the last Emperor of India, and the first Head of the Commonwealth. Deakin Reserve Memorial Gate, which is believed to be the first memorial to the late King George VI, will be opened on November 16 at 2.30 p.m. Premier (Mr McDonald) will unveil a tablet, and the ribbon will be cut by Mrs J. Riordan, wife of the chairman of the Parks and Gardens Committee (Cr. J. Riordan). Another tablet in memory of Alfred Deakin, a famous Australian Prime Minister, who while a State Minister for WaterSupply, inaugurated water conservation and irrigation in Victoria will also he unveiled. Town Clerk (Mr R. West) said today the public is invited to assemble outide the gates for the ceremony. Uniformed Boy Scouts, Girl Guides and High School cadets will attend. A massed choir from Shepparton churches will sing the late King’s favorite hymn. Abide With Me, and a Paean. Public will also hear Shepparton Pipe and City Bands who will play inside Deakin Reserve. In June, the Queen gave the City Council permission to dedicate this memorial to her father, the late King George VI. Two of Alfred Deakin’s daughters have been invited to attend the ceremony, but it is not yet known whether they will do so. The ceremony should be one of the most impressive Shepparton has seen for some time. Shepparton Advertiser (Vic), 7 November 1952.